First of all, I would like to warmly welcome you to this brand new EBC*L website. After long consideration and planning, we decided to renew our corporate image and enhance our online presence thus facilitating more possibilities to our new visitors. Furthermore, I would like to take the chance to summarize the main concept of EBC*L as well as my personal objectives as CEO of EBC*L Arab World. As you might already know, the international network of EBC*L emphasizes our well-considered goals in establishing a standardized training and exam system for everyone worldwide. Our target learning catalogues for each of our exam levels are defined precisely to present an easy measurement of success but also to deliver solid pillars for our structured training concept. EBC*L certificate holders around the world theoretically have the same level of knowledge, the same exam preparation measurements and the same exam structure. This is optimal for the global economy where mobility and competence of people are critical success factors. 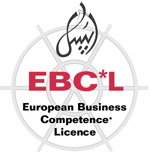 After passing the specific EBC*L exam in Arabic for instance, an EBC*L level A certificate holder from Cairo can continue with the training of EBC*L levels B and C in Amman, passing the exam in English and becoming an EBC*L Certified Manager to start his/her career depending on current expertise, maybe in Turkey, Germany or Qatar. Our EBC*L standard concept makes it easy and possible for all parties to know about the exact acquired knowledge. (b) To encourage Arab economies in the development of their own entrepreneurs, in particular among youth. EBC*L means an attractive and qualitative concept of business education, focusing on practice-oriented knowledge in a short time and on reasonable fees. Dr. Mohamed-Ali Ibrahim holds several key positions in other Austrian companies.